There is limited parking in the area so take Marta, Uber or Lyft when possible! "Juneteenth Atlanta 2019" follow this link and click on the "GOING" button and then start promoting your participation/group participation on the page. Also be sure to invite your facebook friend lists. Invite all your friends and especially those living in or near Atlanta. Please post pictures of your team, business, school, band or whatever you'll be bringing to the parade. Also, copy the flyers on the Facebook page and share it in all your social media. All of us working together ensures a greater turnout. The last few years we successful recorded 15-18,000 interested and ended up with approximately 4,400 - 5000 that attended. Along with your help, we plan to shatter these records in 2019! Lynel Goodwin is the Official Band Leader for Juneteenth Atlanta Parade & Music Fetival. ​Lynel also leads The Band of Champions and is bringing them back to do what they do at the Juneteenth Atlanta African History Parade. The Band of Champions is a high school summer band program composed of students all throughout the Metro Atlanta Area which exists to cultivate the musicianship of Atlanta Area band students throughout the summer, while exposing the students to various performance experiences. Along with performances, the Band of Champions All-Star program invites various renowned clinicians into the band room to share musical knowledge and rehearsal techniques with our student musicians to further enhance their musical experience. Band Of Champions cooling out after their two mile parade. 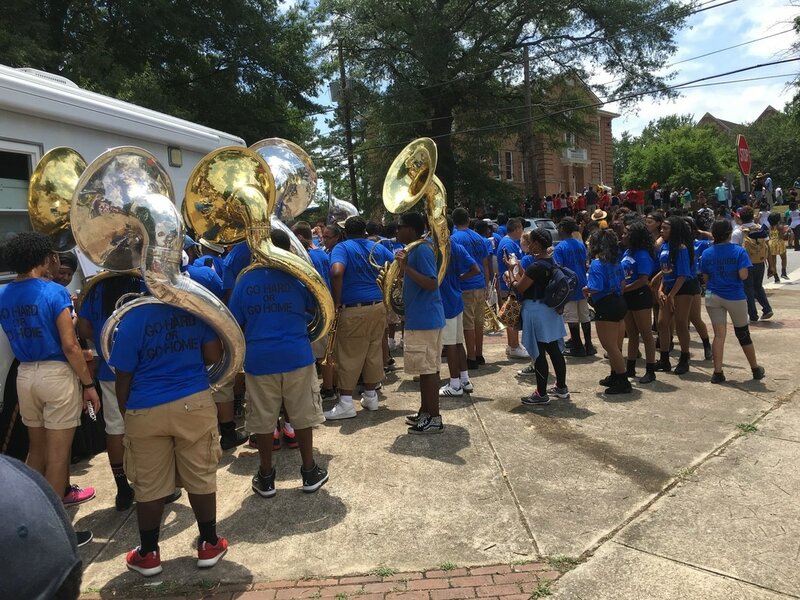 The history of this summer band program began on May 25, 2010 with three gentlemen, Gregory Snow, Keith Rivers, and Marcus Edwards who served as members of the Morris Brown College Marching Wolverines at the time. What started as just casual conversation about band turned into an idea of creating a mass band for musicians of Atlanta during the summer. spread the word and recruit 120 interested band members, he would accept the offered role as band director. Without question, they began working immediately and were soon joined by Joshua Long to help build the program. When the task was complete and brought before Mr. Fanning, he gladly accepted the role as director and thus, on May 28, 2010 the Atlanta Alumni Allstar Marching Band was created. We created this summer band program to encourage ​musicians to keep out of trouble and participate in something positive. While this program can serve as preparation and a recruiting place for colleges, it's true purpose is to unify our city schools through music. We deserve to showcase our musicianship and represent Atlanta school graduates just as other cities do. Our program promotes nothing but positive collaborations among schools and colleges. We are a nonprofit group seeking only to entertain our audience with great music and display a reminders of how important it is to keep music alive in our community. Nothing is expected in return but love and support. We just want the opportunity to show our city how great we are when we are united by music and eventually show the country Atlanta produces the best of musical band students. Outstanding youth! Catch the Atlanta Vikings via Coach Dwight White at the Juneteenth Atlanta Black History Parade! ​the participation of the Harlem Globetrotters! 5. JUNETEENTH ATLANTA HARRIET TUBMAN FLOAT! 9. DAVIS BOZEMAN LAW FIRM FLOAT! Official Juneteenth Atlanta Marching Band"
the umbrella of Juneteenth Atlanta! Black History Parade in the world. Non-Profit 501(c)(3) (EIN 46-4119_ _). to the extent allowed by law. ​​Juneteenth Atlanta Copyright© 2012-2019. All Rights Reserved.